Omega Mobile recently completed a series of tutorials for the Open Screen Project Fund. We created seven demos total that I’ll cover in blog posts coming soon. Each mobile demo/prototype was designed around experiences where Flash Lite and Nokia devices a great fit. 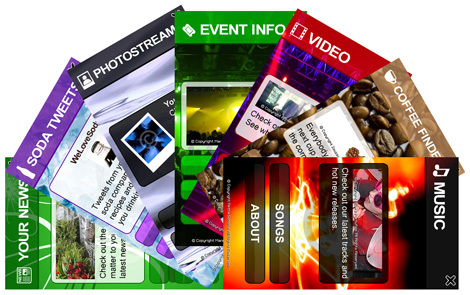 These include rich media, personalized experiences, social media, photo sharing, location based information, music, news, video, advertising and marketing. The demos were designed to be shown as-is, without additional work as well as to be modified easily. Use them to quickly present a concept internally or to pitch outside clients. One of the main goals of each demo is the ability to be able to easily reskin each mobile user interface. Each demo is designed so that the user interface elements as well as the background can be changed in a matter of minutes.